Started this section off today with clecoing the rear seat floor to the rear seat ribs. Match drilled the inboard attach holes and screw holes per instructions. Then cut and clecoed the hinges for the lower seat haves. Once all clecoed I match drilled all the required holes and removed the rear seat floors to install the nutplates on the inner portion of each seat. Next was to locate the baggage door shim and lower baggage door seal channel and then cleco and match drill them. Did the same with the upper baggage door seal channel. Once these were clecoed I attached the close out panel to them. The instructions have you match drill the close out panel for LP rivets. I did not like the protruding rivet heads so I decided to change this and dimple everything for flush rivets. Makes a much cleaner smooth interior. I then proceeded on to cutting out the baggage floor stiffeners, clecoing and match drilling them to the baggage floors. 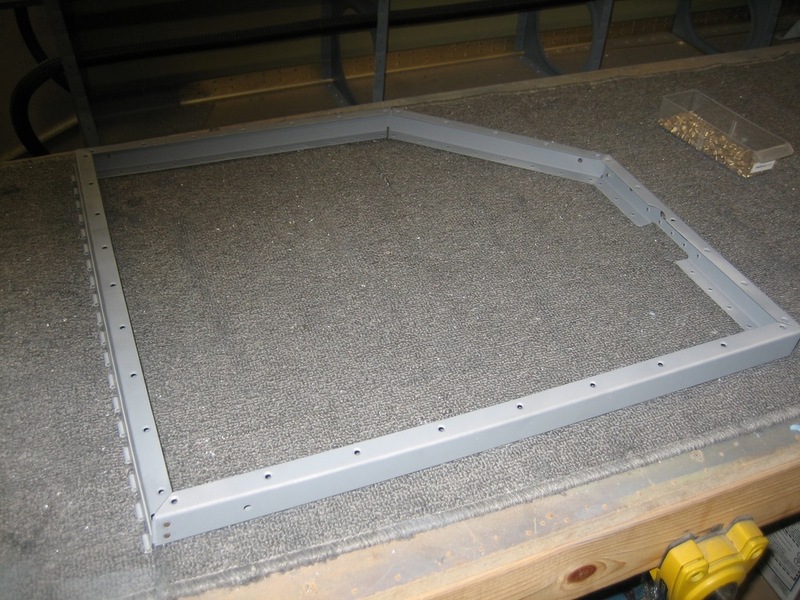 Also drilled the holes in the baggage floor, then deburred and dimpled for rivets. All parts so far are match drilled, deburred, dimpled, preped and then primed for final assembly. 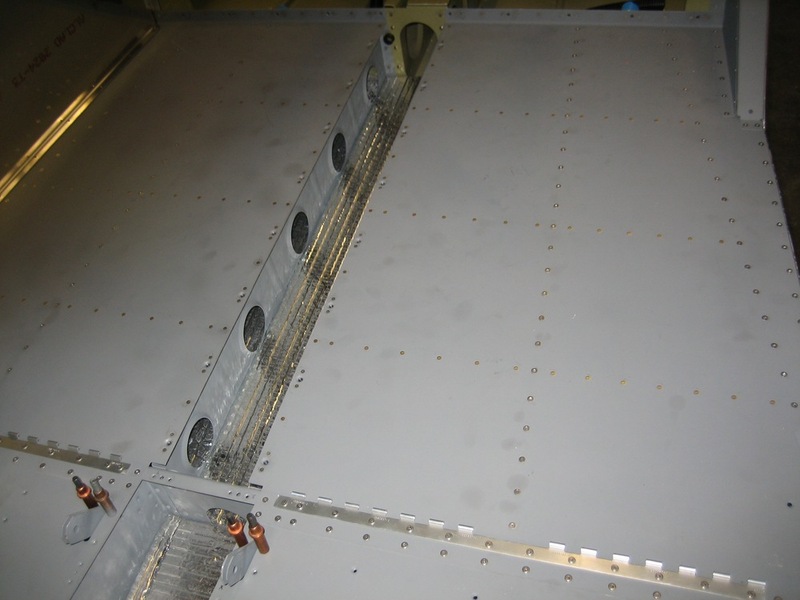 Riveted all the baggage floor stiffeners to the baggage floors along with installing the nutplates to the rear seat floors. Before permanantly installing the rear seat floors and baggage floors. It is a good idea to run conduit for any wires that may need to be run to the tail cone. I got some really cool conduit from Lowes that was made fairly tough. Wanted something that was a bit more stiff and thicker walls to prevent any chance of rub through. You can see the pictures of what I did by clicking here. In addition to the conduit runs, I also installed the wiring for a Comant antenna which will be placed under the left rear seat. You can see pictures of that here. Now that all the conduit and antenna wires are run I am installing the baggage floors and the rear seat floors in permanently. Probably should have taken the time to install some inspection plates for the antenna and step areas but did not. Will have to get those done later now that they are already installed. Now that the baggage floors are in, I finished up installing the baggage door seals and closeouts. Next step is to cleco the right baggage cover to the fuselage bulkhead. The prepare the baggage bulkhead channel. Then cleco this to the top bulkhead, these top rivets will be installed later. At this time you do rivet the bottom of the channel to the bell crank rib and then once again cleco the tailcone forward skin in place. Located the lower baggage bulkhead and clecoed and match drilled the required holes into the bulkhead. Also adjusted the right baggage cover so that it is aligned with the lower baggage bulkhead and drilled the #19 holes through both into the bulkhead. I then did the same with the upper baggage bulkhead corrugation. Now that those are done they have been removed along with the right baggage cover so that they can be deburred and the holes in the right cover could be dimpled. Finished off the right baggage cover and got it primed. While that is drying it went ahead and got all the holes for the upper and lower baggage bulkhead corrugation drilled to install nutplates. I did this by taking a nutplate and installing a screw through the bulkhead and then match drilling using the nutplates as a guide. Not to hard just a bit time consuming. The upper and lower baggage bulkheads have slots wear the shoulder harnesses travel through so you are required to install a couple of wear blocks. Finished drilling these and got them riveted in place. The baggage area section is now complete. Yeah, one more step done and many more to go.